Welcome to the new, paperless, Strange Horse News. With this down-loadable newsletter you can keep up-to-date with Sam�s latest �Little Productions� and find videos, articles, book reviews, special-offers, music, schedule info and more. Feel free to print-out and share items from Strange Horse with your friends. �Maxiqi� 馬希奇 is the Chinese name used by Sam Masich. The name was confered on Sam during the 1985 World Wushu Invitationals in Xi�an, China, when Sam was a member of the Canadian National Wushu Team. 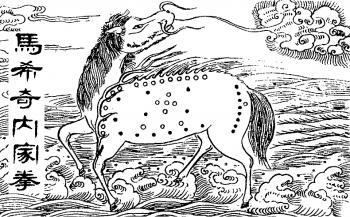 �Maxiqi� (pronounced Ma-h�shee-chee) is �Masich� sinofied and literally translates to 'Strange Horse' (�Ma� means 'horse' and �Xiqi� means rare or eccentric). Video News: 4 New DVD titles! Video News: Special offer; Tai Chi in Performance.